In 1963 an English teacher, who considered passion more important than protocol, smuggled me and a few of his other 14 year old students into a cinema to see a '16' rated film. The newly-released Lord of the Flies was directed by Peter Brook and filmed on a very low budget. It brilliantly transferred William Golding's novel, which we were studying for 'O' Level English, to the screen, and went on to become a classic of the cinema. 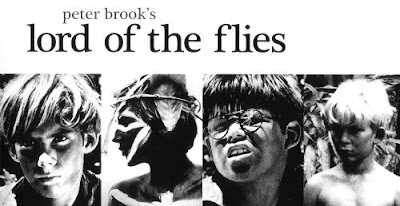 The DVD of Lord of the Flies, which restores Tom Hollyman's stunning black and white photography to its original glory (images above and below), is essential viewing. A bonus on the DVD is the optional commentary by Peter Brook and his production team, which was recorded in 2000. But in the 90 minute commentary there is not one single mention of the music score which, with its repetition of the Kyrie Eleison motif, is an integral part of the film. The music for Lord of the Flies was written by Raymond Leppard. It is his best known score, but his other film credits include the music for Laughter in the Dark, and Hotel New Hampshire. Leppard, who is now 81, was a central figure in the 1960s revival of baroque music, and in particular baroque opera. His approach was musical and scholarly but it avoided the 'brown rice and sandals' approach that infused early music of the time. His 1973 recording of Bach's harpsichord concertos plays as I write. The non-period instrument English Chamber Orchestra accompany Andrew Davis, Philip Ledger, Blandine Verlet and Leppard himself at the harpsichords. Raymond Leppard's repertoire is wide-ranging, and also includes Britten and Nicholas Maw. In the 1980s Raymond Leppard became disillusioned with musical life in Britain and developed his career elsewhere, including 14 years as music director of the Indianapolis Symphony Orchestra. But sadly the second part of his career has never quite matched his achievements of the 1960s. 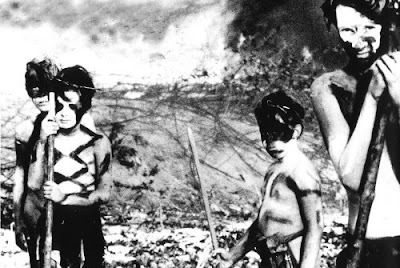 The DVD of Lord of the Flies is well worth seeking out. Not just as a masterpiece of cinematic direction, but also as a unique document celebrating a prodigous musical talent. A journey through that 1960s revival of Baroque music here. Writing this post prompted me to dig out Joshua Bell's recording of Nicholas Maw's 1993 Violin Concerto with Roger Norrington and the LPO. My memories, however, are vivid of the documentary film, "The Sky Above, The Mud Below", which, I now see, won an Academy Award in 1961, and which I saw when I was eight, nine, or ten. (Some of your readers might recall that in late 1961, 22-year old Michael C. Rockefeller, son of Nelson A. Rockefeller who was then the Governor of the State of New York and member of one of the wealthiest families in the United States, disappeared in Asmat, Papau New Guinea, when his boat overturned while he was on an art collecting expedition. He was never found, although his art collection is now a pinnacle of the Metropolitan Museum of Art, in New York City). My first genuine cinema experience. My high school teacher told me ( then 15 years old ) to go & see that film. Italian filmmaker Pier Poalo Pasolini. A gay Italian marxist. He was murdered much later in Rome. Film : The evangil according to Matthew. Music from Anton Webern, Wolfgang Amadeus Mozart, Luis Enriquez Bacalov, Johann Sebastian Bach, Sergej Prokofjew. Many thanks to all serious high school teachers.